The headquarters of the United Nations is a complex served as the official headquarters of the United Nations since its completion in 1952. 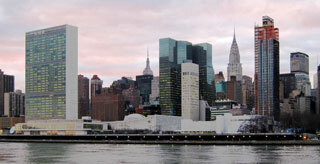 It is located in the Turtle Bay neighborhood of Manhattan, on spacious grounds overlooking the East River. The term "Turtle Bay" is occasionally used as a metonym for the UN headquarters or for the United Nations as a whole. This article uses material from the Wikipedia article "Headquarters of the United Nations", which is released under the Creative Commons Attribution-Share-Alike 3.0 License.